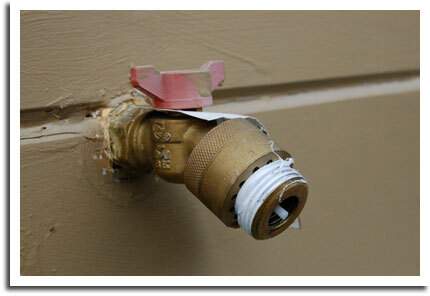 I have been living with a noisy outdoor water hose problem for 1 1/2 years now. Today, I finally had enough and decided to fix the problem. When ever someone uses the hose to water the garden, I can hear a harmonic sound resonating through the water pipes inside the house—quite loudly, in fact. Thinking that the problem was the hose bib, I switched the hose from one bib to another. No luck. The sound still permeated the house when I turned on the hose. So, I searched for noisy water hose on Google and found some sites mentioning that the problem may involve the backflow preventer on the hose bib. Thinking the problem may involve the hose bib, I returned outside and disconnected the garden hose. Turned on the water and I heard nothing but the sound of gushing water. So the problem was not the hose bib after all. Long story short, I switched out spray gun, turned on the water and the problem was solved. All this time, I thought the problem was with the hose bib (which would be “impossible” to fix), but it turned out that the spray gun was the culprit. Should have trouble shooted this like 18 months ago. Live and learn. i have the same problem- but it happens no matter what hose or sprayer is attached to the bib.. so i guess i am just stuck with this annoying noise ? or can i change out the backflow device ?